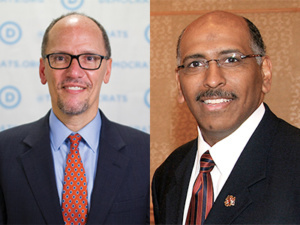 The Washington Ideas Roundtable Series will feature Democratic National Committee Chairman Tom Perez and former Republican National Committee Chairman Michael Steele to discuss how we can find common ground in an era of intense partisanship. This discussion will be moderated by Mickey Edwards, Director of The Aspen Institute Rodel Fellowships in Public Leadership. Tom Perez is the son of immigrants from the Dominican Republic and grew up in Buffalo where he learned the values of a union town: hard work, integrity, service, and perseverance. After putting himself through college with Pell Grants and working on the back of a garbage truck, Tom passed up offers from white-shoe law firms, instead choosing to start his career as a civil rights attorney for the U.S. Justice Department prosecuting racially motivated hate crimes. For the past eight years, Tom had the privilege of serving in President Obama’s administration. First as head of the department’s Civil Rights Division, where he led the charge against police misconduct, voter suppression, anti-LGBT discrimination, and immigrant-bashing sheriffs’ departments. Then as Secretary of Labor, fighting to protect and expand opportunities for America’s working people – from better wages and overtime pay, to retirement security and collective bargaining rights. But Tom’s strongest roots are in local organizing. In 2002, he became the first Latino elected to the Montgomery County Council. And as board president of CASA de Maryland, Tom helped grow the organization from a small service provider in the basement of a church to one of the largest immigrant advocacy groups in the mid-Atlantic. Michael S. Steele was elected Chairman of the Republican National Committee on January 30, 2009, becoming the first African American to hold that post in the Party’s history. As Chairman, Mr. Steele set a new direction for the Republican Party; actively challenging the Party to engage citizens across America and empowering state and local Republican organizations. A self-described “Lincoln Republican,” Mr. Steele earned a place in history in 2003 when he was elected Lieutenant Governor of Maryland, becoming the first African-American elected to statewide office in the state. Mr. Steele is the author of the book Right Now, a call to arms for grassroots America in which he argues for a return to core conservative principles and the launching of an uncompromising campaign for limited government. The Washington Ideas Roundtable Series is made possible with the generous support of Michelle Smith and the Robert H. Smith Family Foundation.